Congratulations to faculty at UCSF Fresno who were selected for and recently graduated from the UCSF Center for Faculty Educators’ Teaching Scholars Program (TSP). Participation is by competitive application. The TSP develops educational leaders and scholars through a rigorous program that involves an intensive seminar series, mentored projects, a network of educational colleagues and collaborative learning. 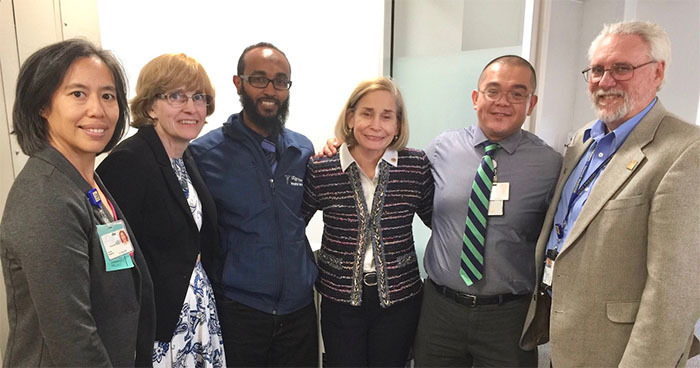 The Class of 2018 includes Loren Alving, MD; Mohammed Elhassan, MD; Ivance Pugoy, MD; and Sarah Stender, MD. We are proud of these faculty and all UCSF Fresno TSP alumni for their commitment to innovation and excellence in medical education. This year’s graduates are pictured here with TSP alum Serena Yang, MD, MPH, interim chief of the Department of Pediatrics and Michael W. Peterson, MD, associate dean at UCSF Fresno.